After making the cake batter pudding cookies and the cake batter milkshake, I had a problem. There was still yellow cake mix left over. I know, I know, what a horrible problem to have! However, since I’m assuming everyone else who made a cake batter recipe also ran into this little problem, they decided to create more recipes! I can’t exactly say I’m upset. My obsession with baked doughnuts isn’t nearly as bad as my love for all things cake batter, but how in the world could I ever resist making these? 1. Preheat the oven to 325. Spray a mini doughnut pan with non-stick cooking spray. 2. Whisk together the eggs, milk and vanilla. 3. In a large bowl, combine the cake mix, flour, sugar, baking soda, cinnamon and salt. 4. Pour the egg/milk/vanilla mixture into the dry mixture and stir to combine. Add sprinkles and stir until combined. 5. 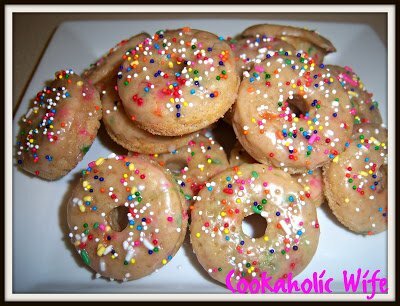 Use a teaspoon to scoop the batter into the mini doughnut pan. Fill them about half way. 6. Bake for 10-12 minutes then gently remove and continue cooling on a wire rack. 7. When your final dozen of doughnuts are in the oven, prepare the glaze by whisking together the powdered sugar, corn syrup and vanilla. Add water 1 tbs. at a time until it reaches your desired consistency. 8. When all doughnuts have slightly cooled on the rack, dip them into the glaze and then top with more sprinkles. Yum! Something about sprinkles just makes things more fun to eat and the cake batter flavor surely doesn’t hurt!